within Human MYH7B. The exact sequence is proprietary. WB: Human fetal muscle, fetal heart and skeletal muscle lysates. IHC-P: Human skeletal muscle, cardiac muscle, pancreas and heart tissues. ICC/IF: Rat glial tumor cell line. Our Abpromise guarantee covers the use of ab172967 in the following tested applications. WB 1/1000 - 1/5000. Predicted molecular weight: 221 kDa. For unpurified format use at 1/250 - 1/500. Expressed in heart, skeletal muscle, testis, and all specific brain regions examined. Slightly lower expression was detected in ovary and kidney, and intermediate expression was detected in lung, pancreas, spleen and liver. Found in fetal liver and brain. Immunohistochemical analysis of paraffin embedded Human heart tissue labeling MYH7B with ab172967 at a 1/250 dilution. Immunohistochemistry (Formalin/PFA-fixed paraffin-embedded sections) analysis of Human cardiac muscle tissue sections labeling MYH7B with Purified ab172967 at 1:1000 dilution (1.03 μg/ml). Heat mediated antigen retrieval was performed using Perform heat mediated antigen retrieval using EDTA Buffer, PH9. Tissue was counterstained with Hematoxylin. ab97051 Goat Anti-Rabbit IgG H&L (HRP) secondary antibody was used at 1:500 dilution. PBS instead of the primary antibody was used as the negative control. Immunohistochemistry (Formalin/PFA-fixed paraffin-embedded sections) analysis of Human skeletal muscle tissue sections labeling MYH7B with Purified ab172967 at 1:1000 dilution (1.03 μg/ml). Heat mediated antigen retrieval was performed using Perform heat mediated antigen retrieval using EDTA Buffer, PH9. Tissue was counterstained with Hematoxylin. ab97051 Goat Anti-Rabbit IgG H&L (HRP) secondary antibody was used at 1:500 dilution. PBS instead of the primary antibody was used as the negative control. ab172967 showing +ve staining in Human normal pancreas tissue. Immunohistochemical analysis of paraffin embedded Human skeletal muscle tissue labeling MYH7B with ab172967 at a 1/250 dilution. ab172967 showing -ve staining in Human normal liver tissue. 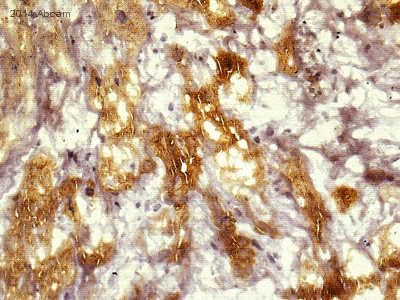 ab172967 showing -ve staining in Human normal breast tissue. Publishing research using ab172967? Please let us know so that we can cite the reference in this datasheet.